Tuesday dawned with some odd news: An unsigned New York 1 reported alleged that Gov. Andrew Cuomo was gathering officials and dignitaries in Queens to celebrate the groundbreaking of the Laguardia AirTrain. This did not make sense. The AirTrain plan is still half-formed with no firm cost estimate or any sort of plan. Cuomo wants to build a leg from the Willets Point subway/LIRR stop to Laguardia via the Grand Central Parkway because there are no NIMBYs to upset, but that’s about all we know. As the day unfolded, I wondered what was happening. Cuomo has been known to push through projects without clarity regarding funding sources (hello, New New York Bridge), but even the AirTrain would require some sort of environmental impact study. And so as the press event unfolded, it became clear that it wasn’t about the AirTrain and rather about Cuomo’s $4 billion public-private partnership that will fund the Laguardia rebuild. The AirTrain is still simply in the works, but how firm those plans are remains to be seen. The plans involve a new Terminal B and Central Hall that should mesh with Delta’s own proposal to renovate its terminal. It’s being funded through private investment (though Cuomo’s statements made it sound like he called in a favor for some federal dollars too), and the project should wrap by 2021, just shy of the end of Cuomo’s potential third term. During the press conference, Cuomo briefly touched upon the idea of an AirTrain. He also claimed it would provide a ride to Penn Station and claimed that East Side Access would connect Penn Station and Grand Central. It was not a banner presser for Cuomo and transit. In the press release, the word “AirTrain” appears exactly once in a quote attributed to State Senator Jose Peralta. All of this leads me to a question: Is the Laguardia AirTrain proposal real or is it simply vaporware from a governor looking to be viewed as “strong on infrastructure” so that he can position himself for a run at the White House in four or eight years? It is of course far too early to judge, but while the Laguardia overhaul is moving forward, the AirTrain is heading for purgatory. For now, the only money allocated to the project is a $78 million item in the MTA’s approved capital plan for “replacement and upgrade” of the Willets Point LIRR station. The project will support full-time service for a “large volumes of railroad customers” with “seamless, direct access” to the AirTrain. The LIRR is to perform the preliminary design and environmental review work before transferring the AirTrain project and oversight of the Mets-Willets Transit Hub to the Port Authority for the procurement and construction phases. So where does that leave us? I’ve written extensively about how the no-build option is likely better than the Willets Point routing for a Laguardia AirTrain and how the time is ripe for an N train extension to Laguardia rather than a Willets Point AirTrain. Yet, Cuomo has an idea for this project stuck in his head, and he has shown a willingness to push through this type of work. It may be right to call it vaporware simply because Cuomo is behind it, but for now, it looks awfully akin to transit vaporware. As now, the LIRR expects to spend the money for the Willets Point work in 2017 and 2018. 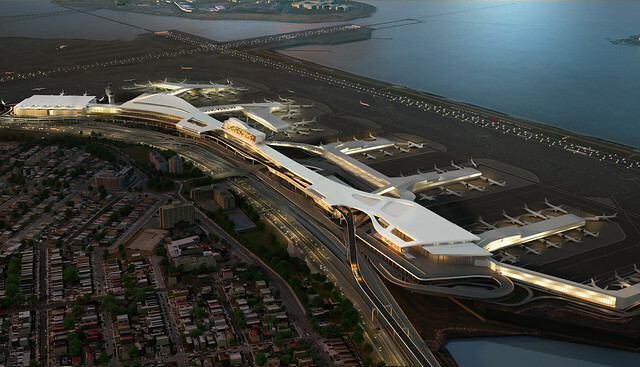 So it’s likely to be a few years before we even know what the EIS assessment for this LGA AirTrain concludes. 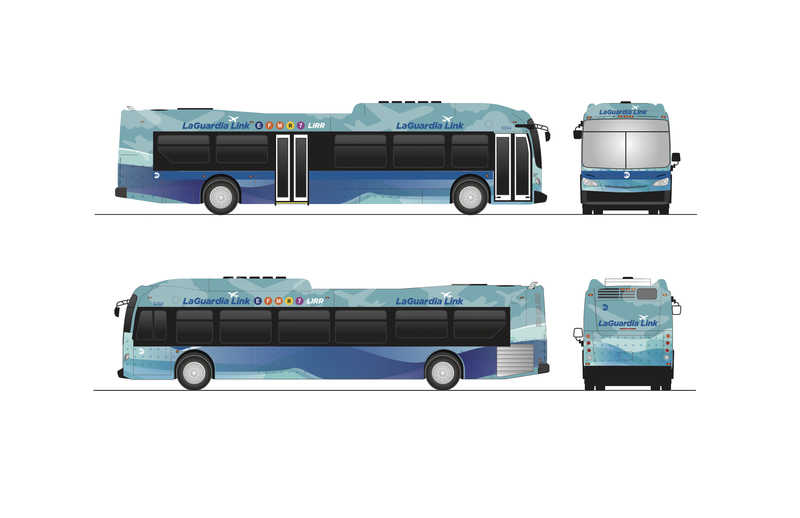 For now, then, the best and only transit upgrades that will accompany the new Laguardia is a rebranding of the Q70 as the Laguardia Link complete with pre-board fare payment. It’s a step in the right direction and one that can be implemented in a few months. It’s not a substitute for a real effort to improve transit to the airport, but then again, neither is the Willets Point AirTrain, whenever it rolls around. Assemblyman Paul Goldfeder has been a tireless advocate for a Rockaway Beach Branch rail study. When last I checked in on the Rockaway Beach Branch line toward the end of 2015, I had kinda sorta vowed to leave well enough alone. The debate has grown a bit toxic with park advocates fighting with proponents of rail reactivation who are fighting against proponents of Select Bus Service with motorists and NIMBYs hovering on the wings. But as Michael Corleone once bemoaned, just when I thought I was out, they pull me back in. The “they” this time is Assembly representative Phil Goldfeder, and the get is Assembly-approved dollars for a true study of the best uses of the fallow right of way. For years, the one ask I’ve had for the Rockaway Beach Branch line is a refresh of a decades-old feasibility study to determine, based on current city growth patterns, whether reactivation would be feasible and at what cost. What we’ve gotten since this nascent effort to revitalize the right-of-way began was a one-sided study from a rails-to-trails advocacy group that was funded nearly entirely through New York taxpayer dollars. It was a rigged assessment from the start and ended with fanciful renderings and no realistic path forward for the so-called QueensWay linear park. Goldfeder is hoping to right that wrong. In a budget passed by the state Assembly this week, the Assembly allocated funding for a feasibility study of rail reactivation and would direct the MTA to complete the study by March 1, 2017. It is, unfortunately, a one-house budget and it’s not clear if the State Senate’s measure will include similar funding (or if Gov. Andrew Cuomo would approve such a request). Still, it’s a sign that someone at least is thinking through this issue. Goldfeder explained his support for the funding. “With so many families in Queens suffering through some of the longest commutes in the city, it’s important that we explore every option to improve transportation. A feasibility study of reactivation the Rockaway Beach Rail Line will do just that. This study will provide us with an accurate picture of the state of the line and show not just what it would cost to reactivate, but also the impact this would have on thousands of commuters in the community,” he said. Goldfeder hopes that a study would provide a comprehensive overview of the state of the right of way. He wants a full assessment of the current condition of the infrastructure (which, in all honest, is not good) and he wants to understand the costs of reactivating the line for passenger service. We haven’t had a clear indication of these costs, potential ridership or the impact to the area in nearly two decades, and the last study was not well received by transit advocates or community activists who disputed its findings. A rail use for this right of way seems like a long shot with many forces aligning against a plan, but it deserves a fair hearing. As I’ve noted in the past, money is the way to get that hearing. If the state does allocate the dollars, the MTA will follow through with a study. And then we’ll know if, in the late 2010s, there is a way forward for the Rockaway Beach Brance line or if this dream should be allowed to fade away while other, productive uses of the ROW are identified. The MTA has asked for ideas for an adaptive reuse of Long Island City’s Montauk Cutoff. It’s been a while, at least on the site, since I’ve delved into the ongoing fight over the LIRR’s unused Rockaway Beach Branch right of way. I’ve kept abreast of goings-on via Twitter, and it has devolved into a bitter fight between and amongst groups that would otherwise be allies. The debate has spilled over into the discussion over nearby Woodhaven Boulevard, and it implicates not only the immediate area and its residents but also disparate neighborhoods and parts of the city that do not have a seat at the immediate table. It threatens to be Queens’ own response to the debacle that was the 34th St. Transitway, and that’s a future and history we shouldn’t want to repeat. We could get into the nitty gritty later, but in broad strokes, this story pits a few interests against one another. One group — consisting largely of DOT, the MTA and a loose coalition of transit advocates — wants to turn Woodhaven Boulevard into an approximation of NYC’s first bus rapid transit line with dedicated lanes and fewer conveniences for drivers. It’s not a perfect plan as it lacks physical separation, and we could debate center-running lanes over side-running lanes for days. But it’s out there, and it’s a creative and proper allocation of street space on an important north-south corridor that isn’t served by transit. Opposing the Woodhaven BRT plan are your usual array of Queens residents with assists from some Brooklynites who believe in the primacy of the automobile and cannot suffer the elimination of lanes for cars, left turns or prioritizing transit riders. Some of these opponents are knee-jerk NIMBYs, but others have decided that the better solution is to turn the Rockaway Beach Branch line into an elevated and dedicated busway. Despite the fact that the right of way is in shambles and work to shore up the structure would be both costly and timely, these proponents — who have found voices in local community papers — argue that the right of way is perfect for a bus. Never mind the fact that it’ll take years, if not decades, for that plan to become a reality, and DOT and the MTA want an immediate solution. Then, in yet another corner are the QueensWay proponents. These folks, led by the Trust for Public Land, have pushed hard to get funding and community support before too many politicians wake up to the reality that turning the ROW into a park without a proper assessment of reactivation would be a future folly. They had some momentum from some loud voices in neighborhoods along the park, but pushback by Assembly representative Phil Goldfeder has slowed this effort and given a neighborhood that stands to benefit a voice in the wilderness. Some of the park advocates have lined up behind the Woodhaven SBS plan, in part, because they recognize that QueensWay won’t actually solve Queens’ mobility issues. SBS then is also a pro-park, quasi-NIMBY solution for a group that has dismissed rail seemingly out of hand. So now, 500 words later, you might be wondering what this has to do with the Montauk Cutoff. Or you might be wondering just what the *%^$ the Montauk Cutoff is. I’m so glad you asked. The Montauk Cutoff is a 1/3 of a mile LIRR right of way that runs through Long Island City, connecting the Lower Montauk Branch to the Sunnyside Yards, and the MTA has decommissioned it. The agency anticipates no near-term use for it, but they are actively preserving the right-of-way should a future use emerge. It is, writ large, the single biggest lesson to take from the Rockaway Beach Branch Line debate: Keep and preserve what can be used for rail while considering adaptive reuse with the understanding that any potential reuse may be only temporary. The RFEI echoes this sentiment. “It is conceivable that the Montauk Cutoff may be required for future transportation needs,” the document notes. “A sale or permanent disposition of the Montauk Cutoff may disadvantage. MTA in the future, and leaving it vacant may invite encroachments and blight. As a result, the MTA wishes to investigate adaptive reuse concepts to preserve the right-of-way for potential future use. Already, the usual suspects are jockeying for position. Some linear park proponents and rails-to-trails group have discussed a mini-High Line-style park through Long Island City and a variety of community groups are actively exploring ways to incorporate this right of way into the surrounding neighborhood. Community visioning groups have seemingly made this a more inconclusive project than that surrounding the Rockaway Beach Branch, but that is, in part, because the MTA is exerting its control and ownership of the ROW while clearly expressing its desire to preserve the ROW. It’s not clear yet what happens with the Montauk Cutoff. The MTA could assess the responses to the RFEI and decide to hold back an RFP. They could just let it sit there for a while before a rail use returns. But, for now at least, it’s a project with far fewer people fighting over its future, and that alone should tell you everything about the importance of both the Rockaway Beach Branch Line and the Montauk Cutoff to efforts to improve mobility around an area in need of transit capacity.